Before we embarked on this exciting venture, we spent a lot of time thinking about what we would like as our first, and probably last, modern motorhome. We intend to knock off work one day and wanted something that would be comfortable and practical for long periods on the road in the years ahead. We went to many motorhome shows, looked at every conceivable layout and configuration and spoke to lots of other owners. We also read many articles and spent hours discussing what we wanted amongst ourselves. Download our FREE guide and find out more details about the TrailLite motorhome build process, quality, handover process and why are they worth the wait. The biggest challenge, in the end, was coming up with something that ticked all the boxes. This was difficult. There were always compromises, as most new motorhomes we looked at were imported and came as a package with fixed specification and limited design flexibility. 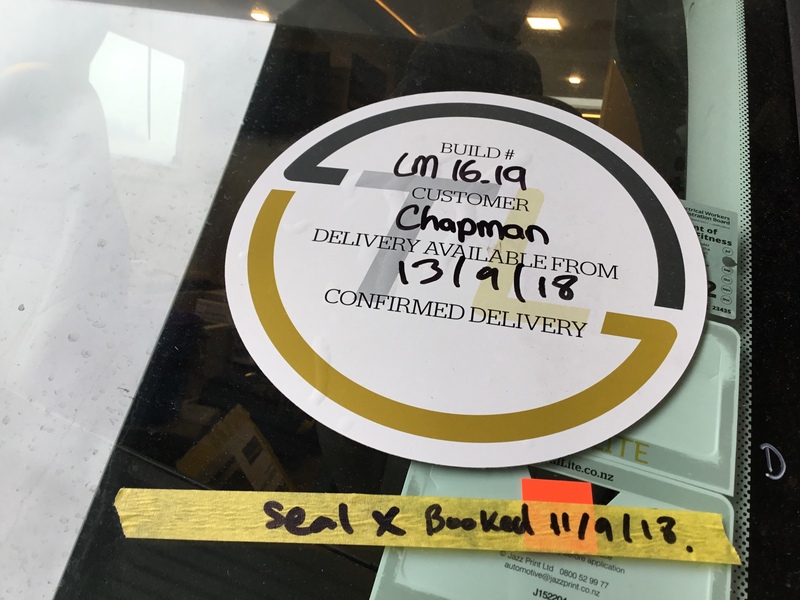 We finally worked out we needed to choose a brand that allowed us the flexibility to specify the interior design and added extras we wanted and the only way to do that was to build our new motorhome. This was when we decided we wanted a TrailLite. We then spent a lot of time with TrailLite's product specialist Greg Campbell who helped us sort out what model would suit our needs and would handle the specifications we were looking for. This stage of the process was great because we were now dealing with someone who was well experienced in this area having been involved for many years in new motorhome designing, specifying and building. Once we had finalised choosing the model we wanted and paid the deposit, TrailLite was able to give us a build slot date. 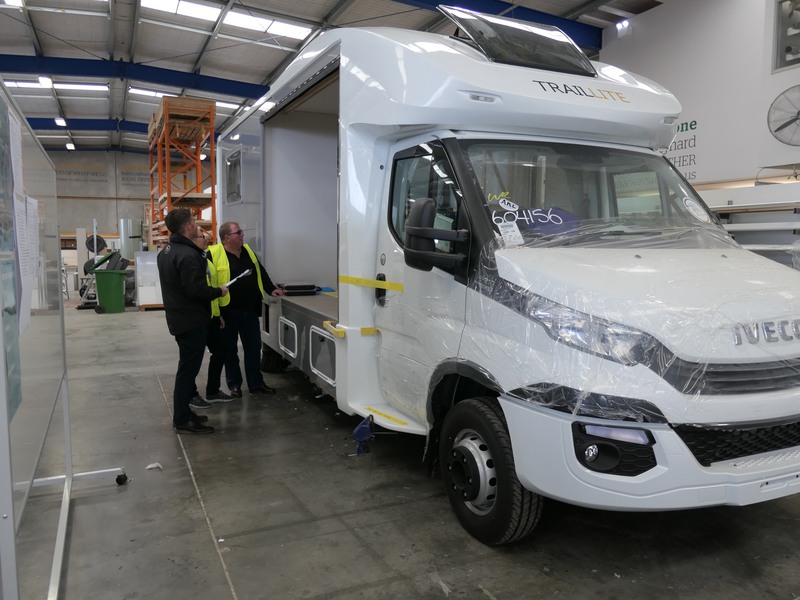 We had been advised up front when first speaking with TrailLite that there was quite a wait for a build slot, as there is a strong demand for TrailLite built motorhomes . However, the upside of this wait was this gave us some extra time to finalise what we wanted from the motorhome. I suppose this was also a bit of a selling point for us as it gave us increased confidence in TrailLite as they had a product with a great reputation and strong demand. The result was we ended up with an even bigger motorhome than we initially set out to buy. We ended up with a TrailLite (8.3m in length) built on an Iveco Daily 3L twin turbo 150kW and with more sophisticated features. When we finally took possession on 13 September 2018, we had been working on and off the project for 17 months. Initially before the actual build started, I thought we would check in at the factory a couple of times while it was being built but stay away until it was finished. Well, just the opposite happened, and we visited the factory at the allocated visiting times nearly weekly but certainly whenever there was some progress to see on the build. This was not too difficult for us as we live in Auckland, so it wouldn’t be so easy to visit frequently if you lived out of the area. However TrailLite has thought of this for all there out of area customers and after signing off on the build contract with Greg, we were handed over to Kerstin Watson who was TrailLites’ “Customer Success Representative”. Kerstin was simply awesome and totally enhanced our experience with TrailLite , in the sense that nothing was ever a problem. She sent us photos of the build progress, sometimes a couple of times a week when there was something interesting that had progressed when we couldn’t get down to visit. When we did visit, she made us so welcome. In the end, it was sad to say farewell to Kerstin, and we are still in touch with her today which gives us so much confidence in dealing with a New Zealand privately owned second generation company, employing people like Kerstin, who oozes sincerity and a high level of customer service. The handover process on the day of delivery was like everything TrailLite does, highly professional and thorough. The handover took the best part of a day. First, a representative from Iveco went over the features and operation of the base truck. Then we moved onto the motorhome itself. Learning all the aspects of the motorhome features were reasonably straightforward partly because of our boat and previous motorhome experience. But we still needed to absorb the awesome features in our TrailLite such as the Finscan central control and monitoring system, a touch screen that controls the electrics, power, solar charge, water tank storage and other operational systems. Plus all the other awesome features the TrailLite offers. So Kerstin still took us through everything in detail which was beneficial. Plus we could contact (which we did) Kerstin after we were on the road with any technical questions. 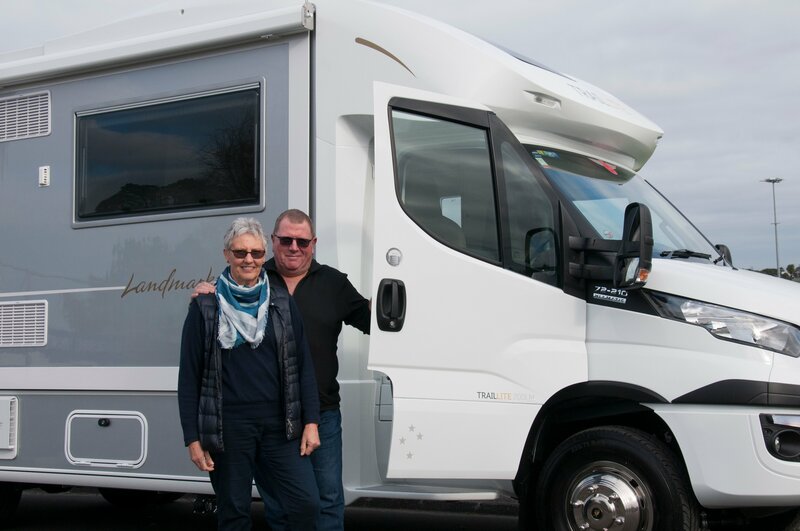 Since owning the Motorhome for five months now and having spent 30 odd nights away in it and travelling close to 6500 km, we both agree the motorhome has delivered above and beyond our expectations. Little features like the way the grey water tank pumps and empties through the black water tank when that has been emptied and gives the black water tank a flush through, and you don’t have to empty two tanks is just so convenient and simple. People often ask us what features we like best on our motorhome and that’s hard to answer as we love so many things about it. However, we do love the slide out-lounge, the roomy separate shower box and great bathroom and the high quality, robust finish of everything. Also because we chose the specifications, colours and furnishings when we spent a good part of a day with TrailLites’ Interior Design Consultant the motor home feels uniquely ours. Plus we like the fact that our motorhome was designed and built in New Zealand by a well-established, (some 60 years ago) family-owned company. What advice would we offer others? Give yourself plenty of time to go through the process. Even when you think you have exhausted all your choices and sorted out what you want, keep working it over as the ground shifts as you work through the exercise. It is a big purchase that you will get so much joy out of, and I think the more planning up front delivers a more personally satisfying product in the end. The first smaller model TrailLite we ordered we chose to have on an “all wheel drive” base vehicle, which we felt offered greater driving/parking flexibility. 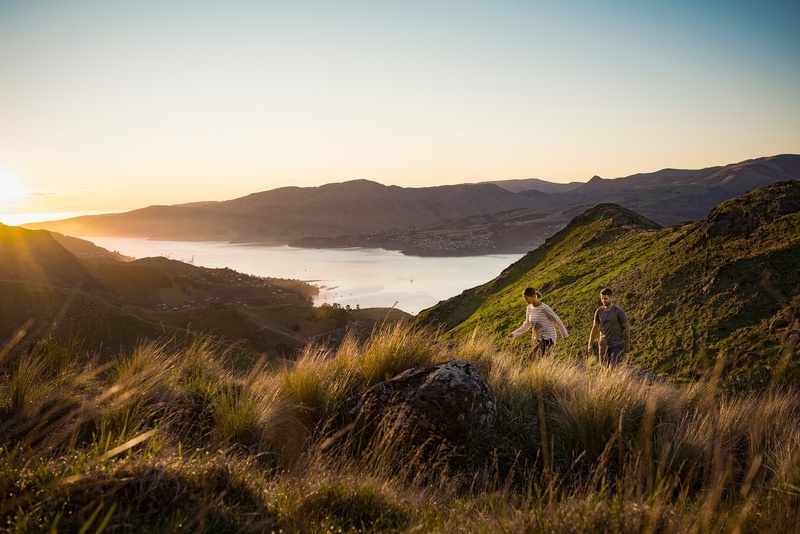 We are going to explore every corner of NZ over the next 15 – 20 years and stay in some of the stunning, out-of-the-way, places our amazing country has to offer. We know that our customers often have great stories to share, are passionate about TrailLite and love the freedom of the on-road lifestyle.